1 in 4 people in America is an immigrant of born to immigrant parents. 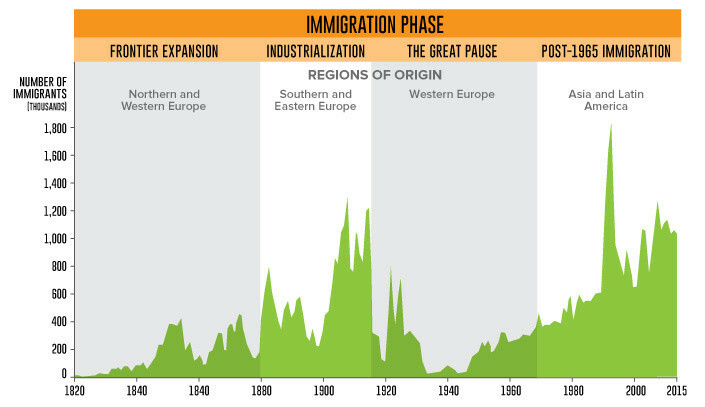 The Irish Potato Famine from 1845 to 1849 drove many immigrants from Ireland over to the U.S..
"This idea lends itself to the representation of history itself, as it shows a sequence of events that have left a mark and shaped the present. If cells leave a mark in the tree, so can incoming immigrants be seen as natural contributors to the growth of a trunk that is the United States." This article originally appeared on Visual Capitalist.